It was a beautiful day in the neighborhood. 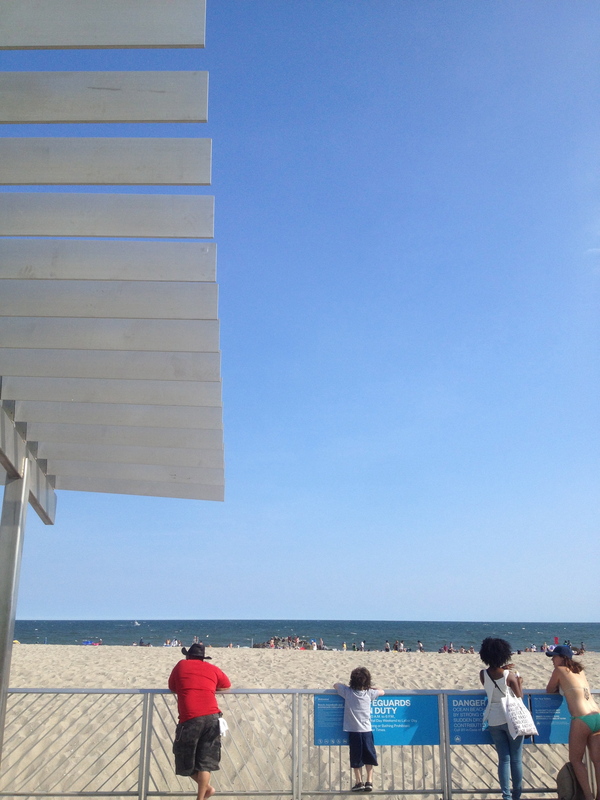 A warm, sunny, almost no humidity Saturday in Brooklyn. Bike: check. Saddle bag: check. Sunglasses, money: check check. Recipe? No la tengo. I usually head to the market with a pretty good idea of what I want to buy and cook. Not this weekend. Inspired in part by the new cookbook I’m editing, where the author’s focus is on method and what’s fresh, what inspires—rather than following a recipe exactly—I set off for the market with open eyes. I went in search of what looked good. What’s in season right now, this week. I heard a rumor cherries were in and was hoping I might snag some of those. But I got to the market late. One stall had em, not many, but I asked if they sprayed and the guy said yes. I appreciated his honesty but walked on by. If I’m buying produce from a Greenmarket I try at least to buy spray-free if not organic, even though it does cost more. There was only one organic stand at the entire Grand Army Plaza market, at least that I could see. And the poor guy isn’t even on the main stretch with the other vendors but set back from the fray. Willow Wisp Organic Farm from Damascus, Pennsylvania. He did not have cherries. But kohlrabi, a variety of bok choy, cilantro, dill, numerous types of lettuces and radishes, and squash. Lots of squash. That got me thinking. I’d buy my first zucchini of the summer and make a faux pasta with it. 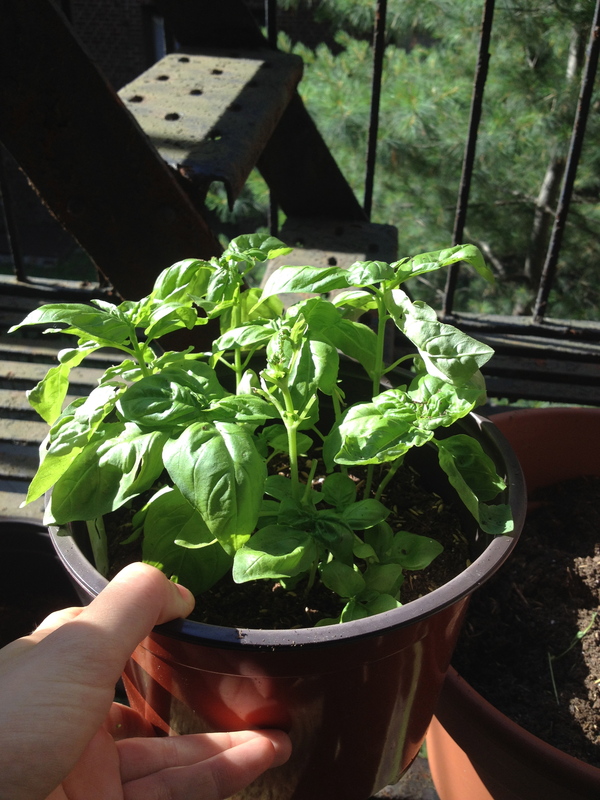 I have lots of basil growing at home so that would make for a nice combination. I bought some of the garlic scapes from Willow Wisp too, thinking I’d mash them with the basil and some olive oil. I knew I also had olives and walnuts back home and thought they’d add some nice saltiness and crunch. A raw and vegan (and gluten-free, if you’re into that kind of thing) lunch that takes just moments to put together. This is a kind of lazy man’s pesto with big payoff. And a recipe of sorts just begging to be messed with. Just start with the zucchini squash and you can add whatever looks good or in season. If you’ve never made “pasta” from zucchini before it’s simple. You can use a regular vegetable peeler and slice the squash lengthwise—you’ll end up with a big heap of zucchini strands that look remarkably like fettuccine. 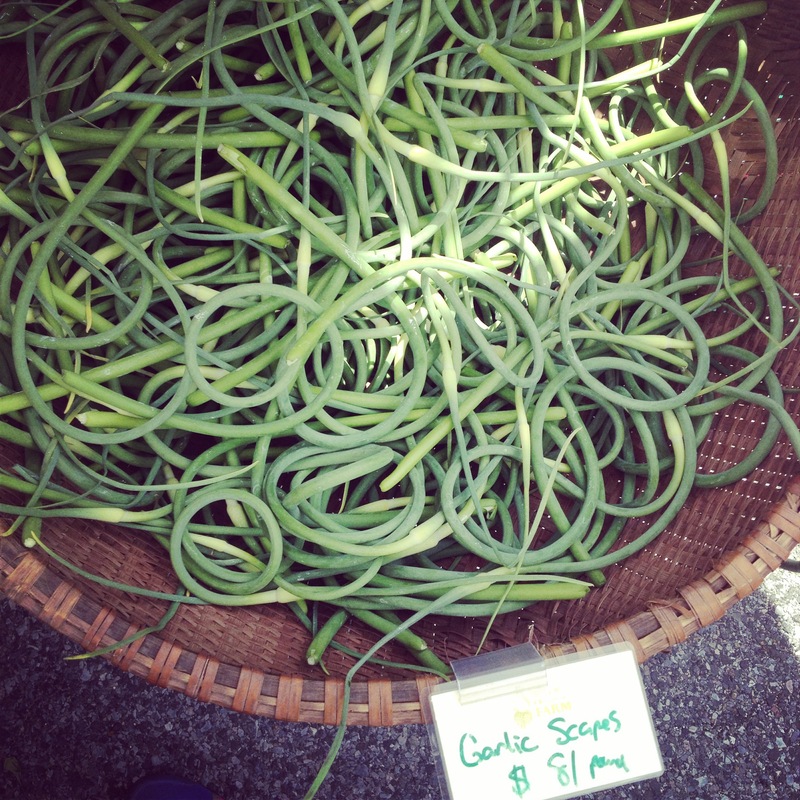 Garlic scapes are the long, curly stalks that jut out from garlic plants. You can chop the green curly scape and use it much like you would garlic; the flavor is milder but you will still end up with potent garlic breath. 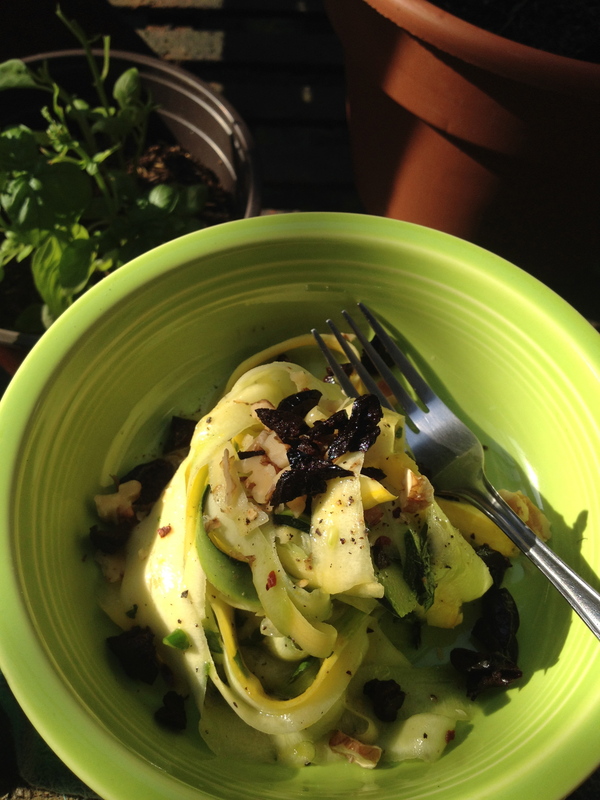 There’s a blog I’ve been reading called This Rawsome Vegan Life and a while back I tried one of her recipes for a raw, vegan, zucchini pasta with sundried tomatoes. This is a kind of riff on that, so thank you Emily! 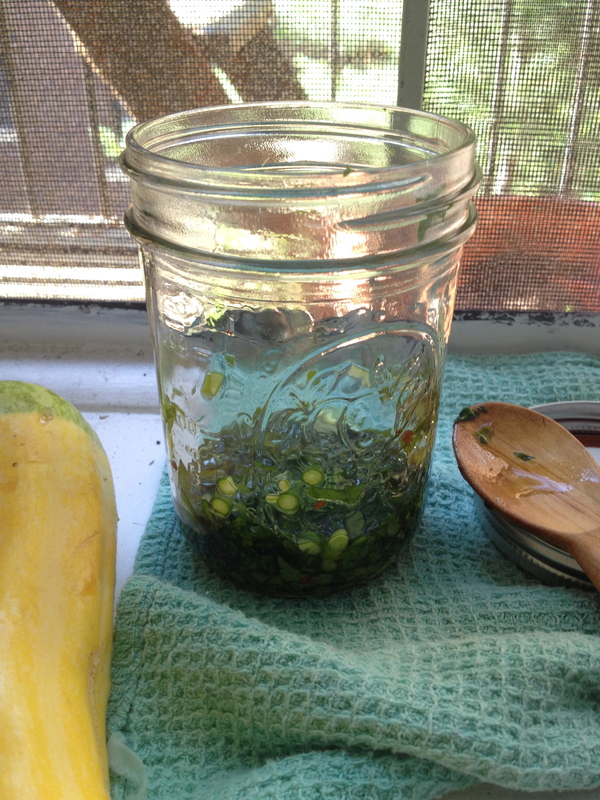 Combine the olive oil, basil, scapes, lemon zest and juice, and chili flakes in a glass or jar and muddle, trying to extract flavor from the basil leaves. Set aside for at least 15 minutes and prepare the pasta. Using a vegetable peeler, slice the zucchini lengthwise until you end up with a heap of long strands. Place in a large bowl and toss with the basil oil. Let this sit for 10-15 minutes before eating, the zucchini will absorb more of the flavors. Add the walnuts and olives before serving. Salt and pepper to taste. This recipe could be made with any number of substitutions or additions. Regular garlic (or none) instead of the scapes. Sundried tomatoes. Capers. Shallots. I think the most important part thing to get right is enough acidity, spice, and salt. Or fresh peas and ricotta or feta with mint instead of basil. 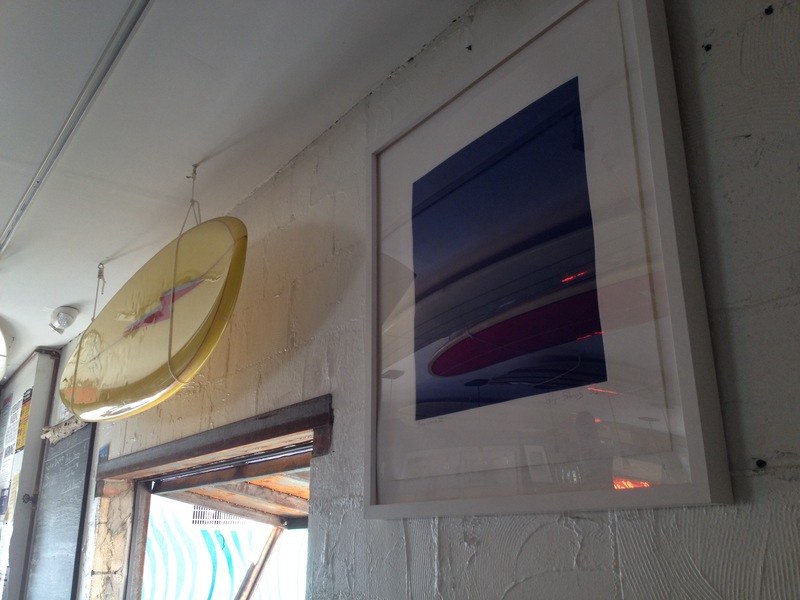 The two bottom photos are of Rockaway Beach from this past weekend and an art show hosted in part by PS1 at the Rockaway Beach Surf Club. My friend Shingo Francis’s work is the blue piece. I’m kind of regretting right now I didn’t stay for the Patti Smith – Michael Stipe – James Franco performance(s)! And a final note on the World Cup: not pleased that Mexico lost to the Netherlands today, and not until the 88th minute or so. Looking forward to watching US-Belgium Tuesday. Been too long since my last post. It’s not that I haven’t been eating anything good, just nothing too post-worthy, but also I’ve just been busy. Working, occupying Wall Street, taking care of Grandma, studying Japanese. Even for me food can sometimes take a back seat. But not for long! 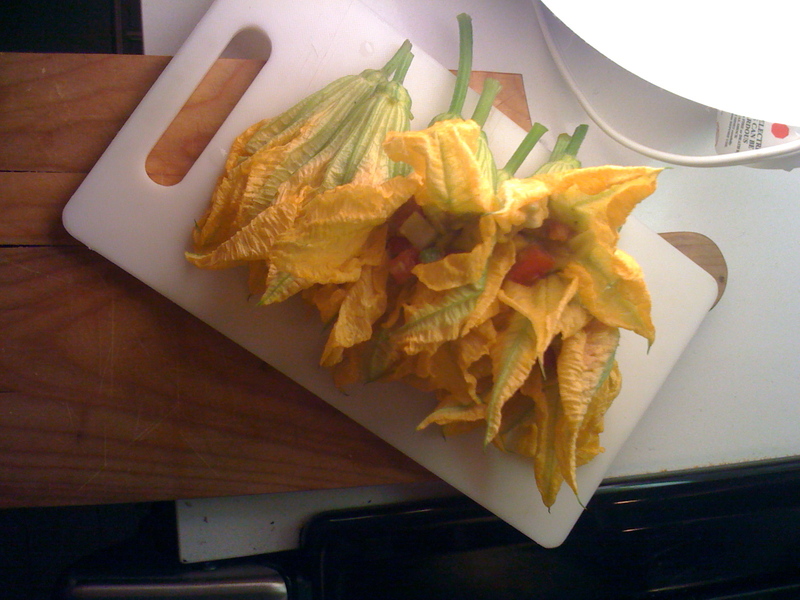 My slump changed on Saturday when a friend brought over last-of-the-season squash blossoms from the farmers market. The first time I had these babies was in Rome when I lived there back in 2003. I seem to remember they were something of a speciality in the city, especially stuffed with mozzarella (and sometimes anchovies), battered, and fried. In fact, that’s the only way I’d ever had them, from Rome to New York to Vermont. But in a bold and unexpected move, my friend decided to serve them raw. 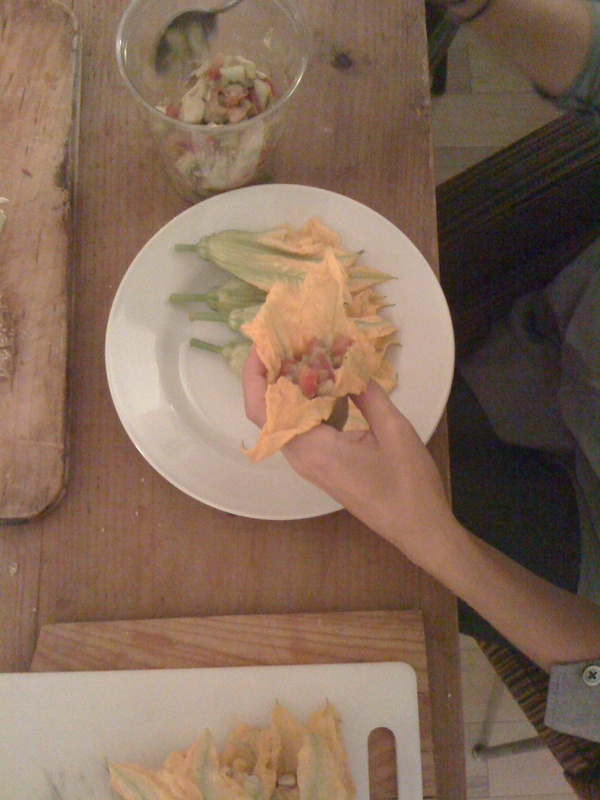 She brought over a mixture of avocado and tomato and assembled them at the kitchen table, neatly spooning them into the cleaned blossoms. I was waiting for her to nudge me out of the way at the stove and start frying – I assumed they must be fried! – but she had us roll them up and bite in, unadorned by batter or copious oil. 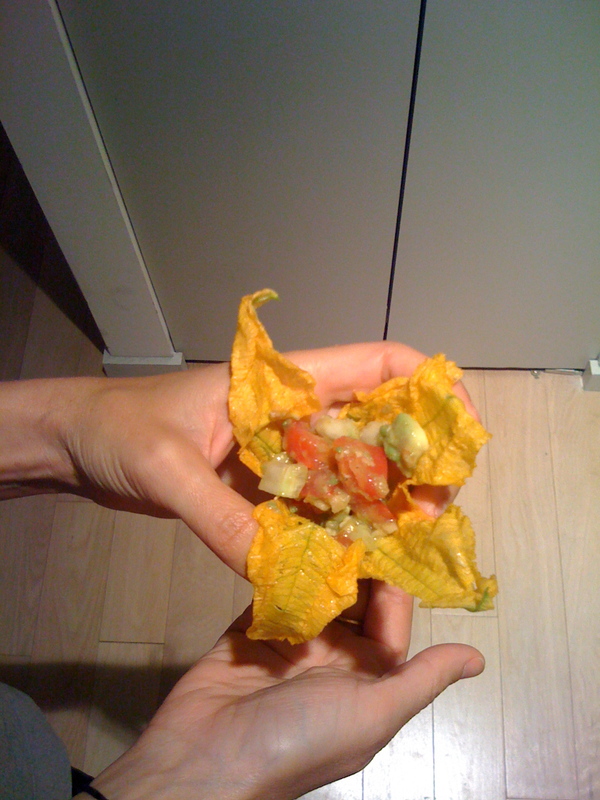 The avocado was a soft and creamy contrast to the somewhat sturdy petals of the blossom and the tomato provided just the acidic bite to round out the flavors. For those that don’t know, squash blossoms are just that – the flower that blooms from both the male and female squash, and typically we’re eating the flowers from zucchini specifically. As I mentioned, they’re often served stuffed and then fried or baked, but you want to remove the pistils first from the female flowers and stamens from the males. I mean, who wants to eat reproductive organs with dinner? And you can eat the whole flower but avoid the hard and fibrous stem. We served the stuffed blossoms as a first course to a meal that included white beans simmered with turmeric, coriander, and chile; a pork roast with a rub of cumin, black pepper, and fennel seeds; and sauteed kale with cayenne, lemon and garlic. I think these may in fact have been the only swollen ovaries I had all summer, and according to signs at the farmers market last week, they will be my last, until next summer. Serves us right I suppose, for all the slandering of excess zucchini all summer long, that we should be denied any for another year. Who you calling swollen? What do you make in August, peak of the summer harvest, when stands at the farmers market overflow with zucchini, eggplant, and tomatoes? Ratatouille! Traditionally a French Provençal dish of stewed vegetables and herbs, ratatouille is a meal on its own, makes for a great lunch, or can be paired with grilled meats. Yuji suggested preparing it with lamb in the same pot which actually sounds quite good. Next time. Variations on the recipe abound, and my own changes include the addition of chickpeas and a garnish of grated Parmesan (or Ricotta Salata, as I used last night). 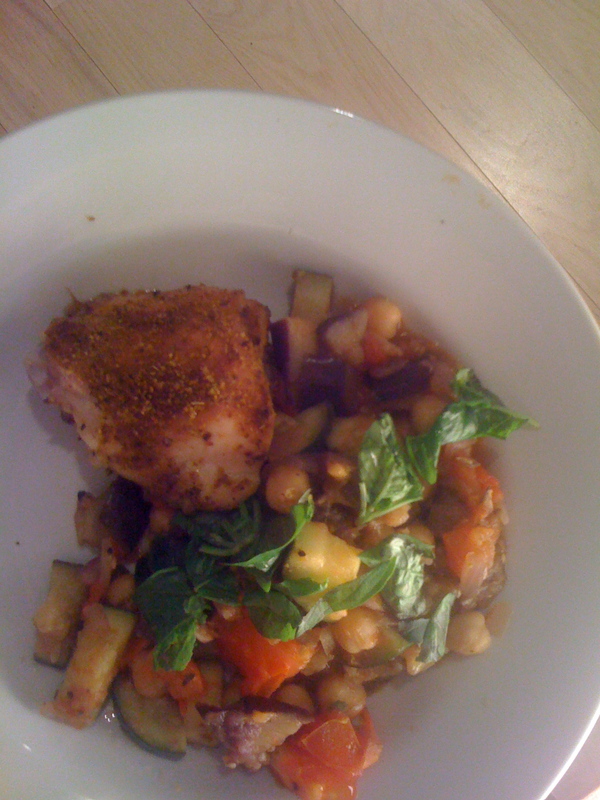 The first time I tried something like ratatouille was about twelve years ago, when my step-mom Bonnie made a quick dinner of whole canned tomatoes, eggplant, and chickpeas. I believe she didn’t even use garlic or an onion. To my young taste buds this dish was a revelation. Here is my version, which makes enough for lots of leftovers, and is hard to mess up. As an aside I just have to say I miss playing with my friends’ Canon 7D Digital SLR camera on Long Island. That’s what took the photos of my blog posts from out there and it’s hard to go back to the ole iPhone so I’m saving up for a serious upgrade. 1. Heat the oil in a large sautée pan over medium heat. Add the eggplant and season with salt and pepper. Continue to cook over medium heat until the eggplant becomes soft and golden, about 10-15 minutes. 2. Then add the zucchini, stirring occasionally, until mostly softened, 5 minutes. Add the onion and cook an additional few minutes, stirring. Next add the chopped thyme and a couple stems, which you will discard later. After a few minutes add the garlic. 3. 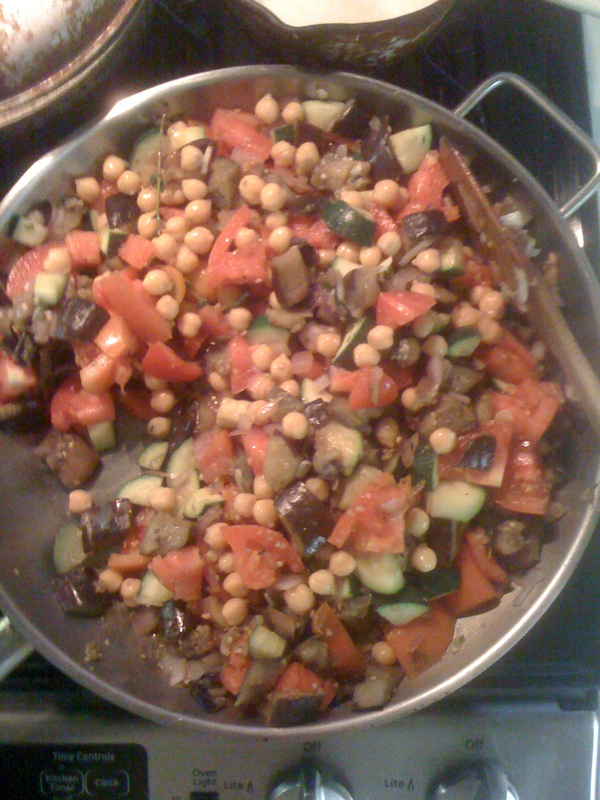 Add the tomatoes, cook until they begin to fall apart, then add the chickpeas. Let this cook for another 5-10 minutes then remove from heat and fish out the thyme stems and discard. Garnish with basil and grated cheese. Serve on its own, with nice crusty bread and butter, or with grilled chicken or lamb.